Other photos: Photo 1, Aerial profile, Aerial profile, Aerial profile, Aerial profile, Salon, Aft Deck, Helm seating, Profile, Photo 10, Profile, Profile, Bridge, Helm on bridge, Navigation, Electronics, Electronics, Bridge, Photo 19, Bridge, Bridge seating, Bridge seating, Bridge seating, Bridge seating, Bridge seating, Bridge seating, Helm, Helm, Helm, Canvas, Aft seating, Aft seating, Aft seating, Aft seating, Aft seating, Aft seating, Galley, Master Stateroom, Master seating, Master seating, Galley, Master seating, Head, Head, Galley, Galley, Galley, Galley, Galley, Salon, Salon, Salon, Salon, Salon, Galley, Washer/Dryer, Head, Head, Shower, Guest Stateroom, Guest Stateroom, Guest Stateroom, Guest Stateroom, Guest Stateroom, Guest Stateroom, Guest Stateroom, Guest Stateroom, Guest Stateroom, Guest Stateroom, Guest Stateroom, Guest Stateroom, Guest Stateroom, Head, Guest State Room, Guest State Room, Guest State Room, Guest State Room, Crew quarters, Crew quarters, Engine room, Engine room, Generators, Engine room, Engine room, Engine room, Engine room, Engine room, Engine room, Engine room, Engine room, Engine room, Engine room, Engine room. It's a Boater's Dream, the perfect combination of fishing, relaxation, convenience and comfort. Stretching at a length of 64 feet, the features and accommodations are endless. 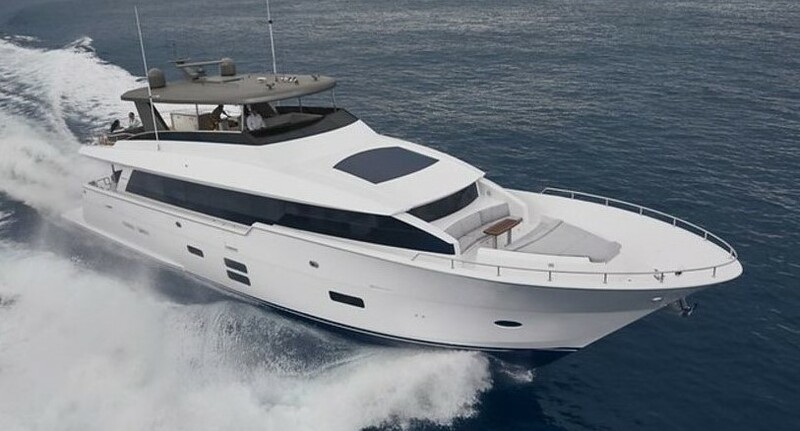 Fish with the utmost confidence aware of a strong and durable exterior structure, an innovative hull design and a sophisticated propulsion system. Her interior offers a stunning and spacious living area with a four -stateroom, three-head layout that can accommodate a crowd without ever feeling crowded.